The very talented band Juniper Lane is returning to Iota this Friday night, and I'm very excited to be blown away again by lead singer Vivion Smith's amazing vocals. Last time I saw them perform at Iota, I was so impressed that Juniper Lane instantly shot up near the top of my list of favorite local bands. They have excellent audience engagement, poise, energy, and enthusiasm for their music that it almost guarantees a fun night out. Melodime will be opening for them at 9pm, who I have have never seen before but curious to see how they incorporate a violin into their five piece rock/blues/folk/country band. It seems that everyone is talking about the updates of the new restaurants set to open soon in the ever growing Clarendon neighborhood. This Washingtonian article details how the owners of Liberty Tavern are increasing their ownership in local territory, with Lyon Hall and Northside Social coming soon. Northside Social is the replacement for the closed Murky Coffee on the same spot behind St. Charles Church. It will also serve coffee like Murky, but will also offer wine and I imagine a more sophisticated/less hipster atmosphere. Lyon Hall will be a "European-style brasserie", and have what appears to be a operational basement. Given they have applied for a live music license from the County until 1am, I'm wondering if they plan on hosting live bands in the basement similar to the DJ's at Eleventh's basement. 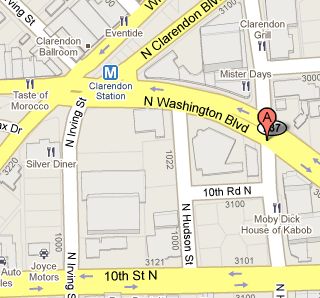 It will be located at 3100 Washington Blvd, marked on the map above. Thanks to all those who sent me tips on this article via email and twitter! I have been lagging on updating this blog lately, hope to get back in the swing of things soon. 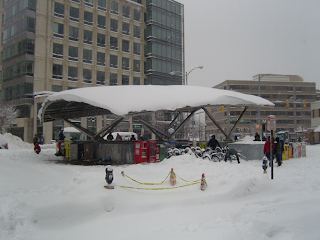 The second major snowfall of the season blanketed Clarendon in almost two feet of snow, shut down half of the restaurants and venues, and left cars stuck in snow drifts. 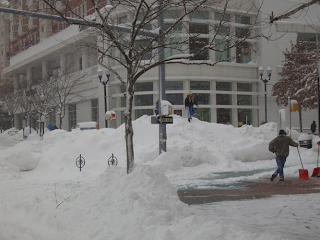 Many residents took to walking in the plowed streets to stave off cabin fever, some of them skiing, snowboarding and sledding over the massive snowdrifts. Someone organized a snowball fight on Craiglist at 3pm around the Metro station. A couple dozen people participated, but the snow was too powdery to make adequate projectiles, and the police where called due to possible public drinking. RiRa, Liberty Tavern, Gilattos, Hard Times, Mister Days, Boulevard Woodgrill, and Flatbread all stayed open today to help warm up those who ventured out. 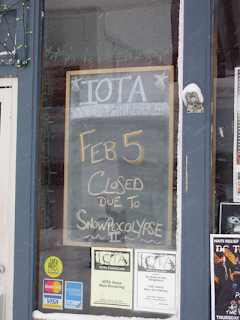 Sadly Iota, Mexicali Blues, Cupcake Bakery, and La Tasca all closed. 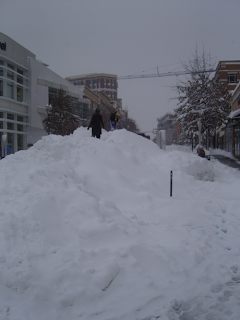 These are a few shotsI took, and more Clarendon snow pictures can be found on this Flickr gallery and at the brand new ArlNow.com. There is several races planed for the upcoming Valentine's weekend, including the Cupid's Undie Run on the 13th. This 1.75 loop around the Capital starting is raising money for the Children's Tumor Foundation. Unlike other races, this one requires its participates to wear only underwear during the event. Luckily its a short run, and the fact that those over 21 have access to drink specials helps too! The $30 registration provides "access to all day drink specials, post-race food, t-shirt, and the opportunity to gallivant around the Capitol in your bedroom best!" Becky's Fund, a charity supporting domestic violence prevention. The non-profit's founder, Becky Lee, was runner up on Survivor: Cook Islands and used the money to start this charity which "leverages education, Web 2.0 technology and essential resources to enable critical one-to-one connections between victims and survivors."